If you’re looking for an affordable web hosting company, there’s no doubt that Bluehost will be on your radar. But what about TMDHosting? If you’ve heard of them, you might notice that they both seem to cater to websites that are starting small, but they both have plans and upgrades to help your website grow. We’ve taken the liberty of doing the research for you as to decide for yourself which of these two hosting companies is best for your website. 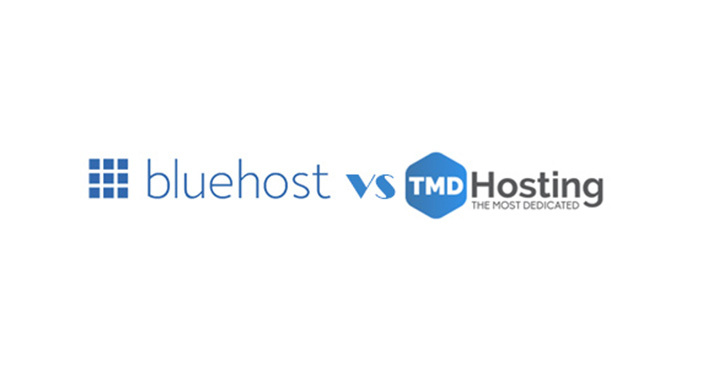 Read on our Bluehost vs TMDHosting comparison to find out more about their performance, prices, plans, pros and cons. Bluehost has the usual 99.9% uptime guarantee, with an actual average of 99.93%, which is good, but just below the industry standard uptime (99.94%). TMDHosting has a stellar 99.99% uptime guarantee, giving them the advantage in reliability between the two hosts. For speed, you’ll want a page load time of fewer than 5 seconds if you don’t want your visitors to bounce. You’ll be good with both hosts, as Bluehost has a 1.4 second page load time. However, TMDHosting blows them out of the water with their average 8.5 ms page load times. They claim it’s due to their 7 layers of cache. Bluehost and TMDHosting are both known for being hosts that offer the best promotional deals for those on a budget. They also have many other options, so you can grow as big as you want and stay with the same host. The main difference between these two hosts is that TMDHosting has SSD (solid state drives) in their servers, which make load times 20 times faster. TMDHosting also offers one free domain for life, which is almost unheard of. TMDHosting is much better than Bluehost here, even though they’re starting rates are lower. Basic security is offered by both hosts, such as hotlink protection and spam filtering, and both have Linux-based servers. However, Bluehost always charges $50 for their SSL certificates. Some of TMDHosting’s plans offer free SSL. TMDHosting also has 7 data centers based all around the world, which ensures safety, as well as speed around the world. Bluehost has several global data centers, but they are all based in the United States, India, and China, so some areas of the world will experience much slower load times than others. TMDHosting pulls ahead in security because of their offer of free SSL certificates. Bluehost and TMDHosting are both user-friendly hosting services. They both offer cPanel for free, though Bluehost has an enhanced version to make it a little easier to use. Both also have a marketplace where you can 1-click install virtually any application or scripts you want, such as WordPress, Drupal, eCommerce applications, or forums. They both include an easy to use drag-and-drop website builder if you prefer that method. The biggest difference in usability between these two hosts is that TMDHosting offers to help transfer an existing website for free. Bluehost will help, too, but there is a $50 charge for this. TMDHosting is superior in customer service. While both TMDHosting and Bluehost offer 24/7/365 support, Bluehost has poor reviews. TMDHosting has a trademarked Genius Support that is highly trained to help you with any problem fast and effectively. They also offer a 60-day money back guarantee, while Bluehost offers only a 30-day money back guarantee. If you’re still deciding, here are the pros and cons for TMDHosting in a nutshell. There’s no doubt that TMDHosting is the best hosting for your money. Their SSD drives and 7 layers of cache allow fast page load times. Their service is secure and very reliable, with one of the best uptime guarantees in the industry. If you choose TMDHosting, you’re making the right choice. Do not forget to share with us any thoughts you have on this Bluehost vs TMDHosting comparison!